Kombumak-kamaboko is fish strips wrapped in kombu seaweed. It is commonly eaten with soy sauce. It also is high in potassium. 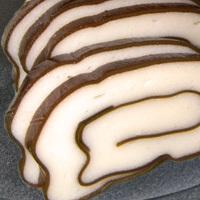 Kamaboko is a dish made from surimi fish paste. Other types of kamaboko include: summaki and yakiniku kamaboko. The calories in Kobumaki-kamaboko per 200g(1piece) is 168 calories. Kobumaki-kamaboko is calculated to be 84Cal per 100 grams making 80Cal equivalent to 95.24g with 22g of mostly carbohydrates、17.8g of protein、1g of fat in 200g while being rich in vitamins and minerals such as Sodium and Potassium.